"The horizon is the line that emphasizes the infinite." Sitting majestically high in the Alps, the cruciform like assemblage contains three bold architectural volumes clad in corten steel. 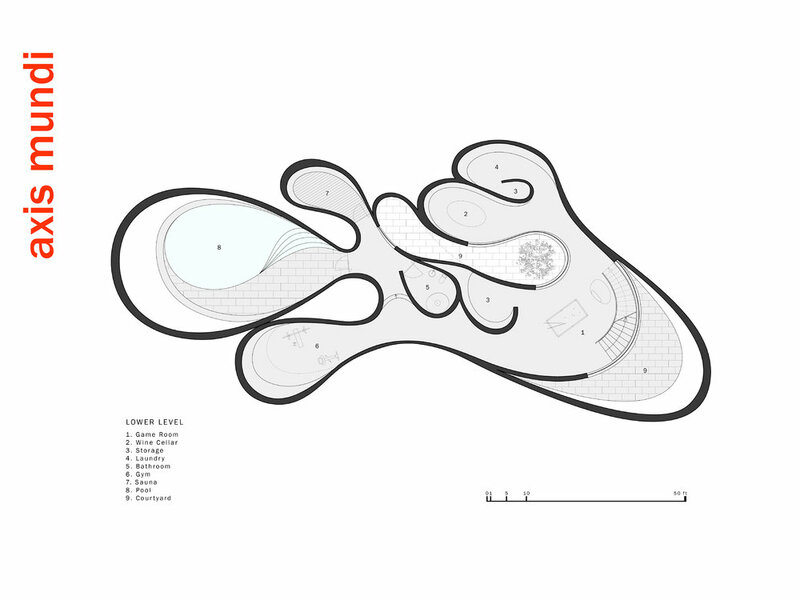 Conceptually the project is organized by three mutually perpendicular planes (the three Cartesian coordinates of x, y, and z): An entry tunnel/bridge, a tower which contains the vertical circulation (staircase and elevator) and the main habitable space, which is suspended weightlessly above the valley below. In essence, this is a dwelling meaningfully stripped of all nostalgia from the material world. One is immediately reminded of the great German romantic poets and painters like Caspar David Friedrich and the poet Heinrich Heine, who’s work emphasized the tension between the daily world and the irrational and supernatural projections of creative genius. The project is a ruin from the future and its poetic power lies in its supreme muteness, as a place to contemplate the horizon and eternity in silence. Total Area: 4000 sf. Major Materials: Steel and concrete structure, corten steel, and glass. This weekend retreat, nestled in a grove of aspens in Lizard Head Pass, Colorado, embodies the words of Henri Poincaré: “Ideas rose in clouds; I felt them collide until pairs interlocked, so to speak, making a stable combination.” It directly challenges many of our ideas about home. Rather than a place offering the illusion of protection from the outside world through solid structure, its openness, light and reflectivity make it arguably more transparent than even Philip Johnson’s iconic Glass House. This weekend retreat, nestled in a grove of aspens, embodies the words of Henri Poincaré: “Ideas rose in clouds; I felt them collide until pairs interlocked, so to speak, making a stable combination.” It directly challenges many of our ideas about home. Rather than a place offering the illusion of protection from the outside world through solid structure, its openness, light and reflectivity make it arguably more transparent than even Philip Johnson’s iconic Glass House. 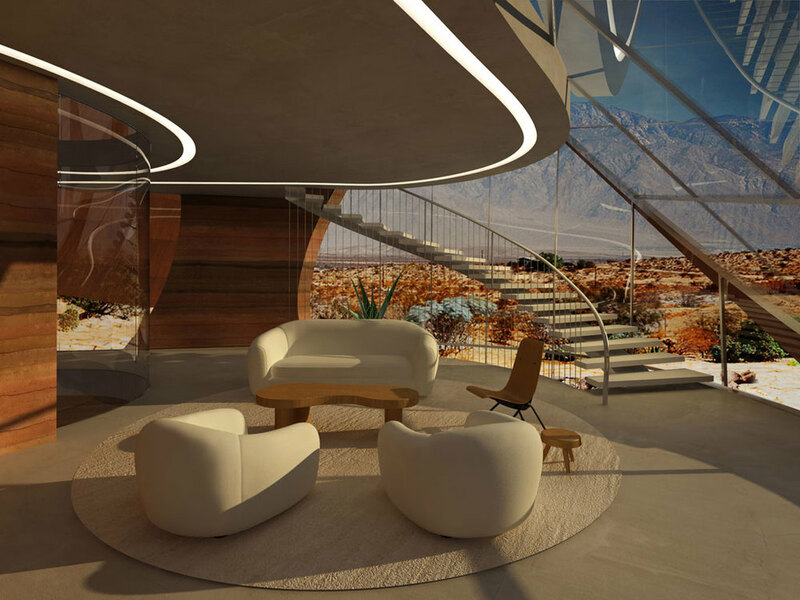 Featuring a floorplan that is an abstract interpretation of a cumulus cloud, the home’s five rotated, elliptically shaped glass pods approach invisibility at certain times of the year. 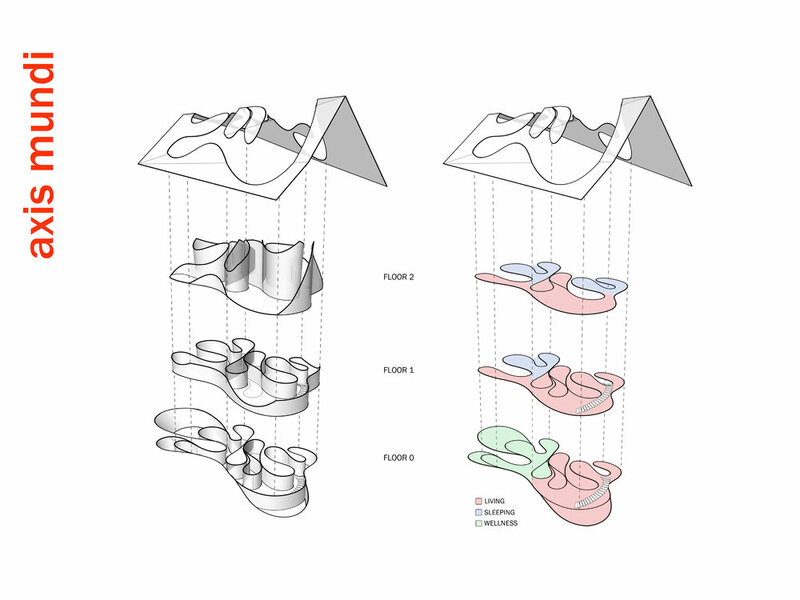 Each pod serves a distinct programmatic function, though together they facilitate an easy and fluid flow accomplished by minimalist doors placed at the interstices where the pods meet. It functions as an ethereal meeting place between earth and sky. Total Area: 2400 sq. ft., 600 sq. ft. exterior deck. Major Materials: Steel structure, curved architectural glass, anodized aluminum, and epoxy flooring. No mission is impossible. The X Lab is a stealth research facility for Lockheed Martin Skunk Works. Their charter is to create game-changing foundational technologies that inspire, protect and connect our world. Founded in Palo Alto, California in 1956, Lockheed Martin helped seed what would become Silicon Valley. They continue to evolve and lead the way in new realms, like lasers, nano-materials and informatics. Set on a lush campus like setting of 25 acres, the buildings oddly shaped design resembles the wings of air planes and the faceted skins of newly developing jet fighters. The building looks like it’s going to take off at any moment. It is referred to as “the stegosaurus” by insiders, because if it’s spiky exterior. 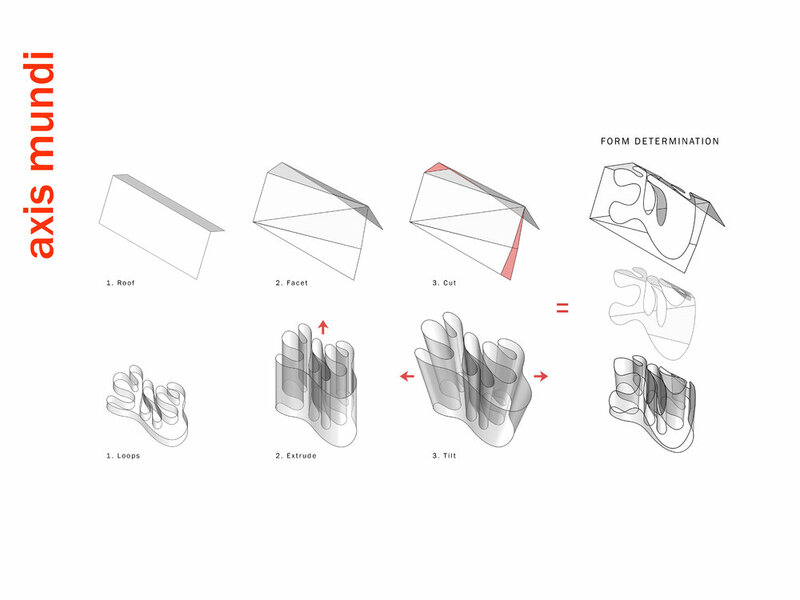 The main circulation spine is a zigzagging atrium that meanders through and connects all of the various work spaces, lecture halls, classrooms, and research labs in a non-hierarchical way, thus encouraging the exchange of ideas between the various working teams. The entire roof is clad in octagonal shaped photovoltaic tiles that were specially designed for the building. Total Area: 270,000 sf. 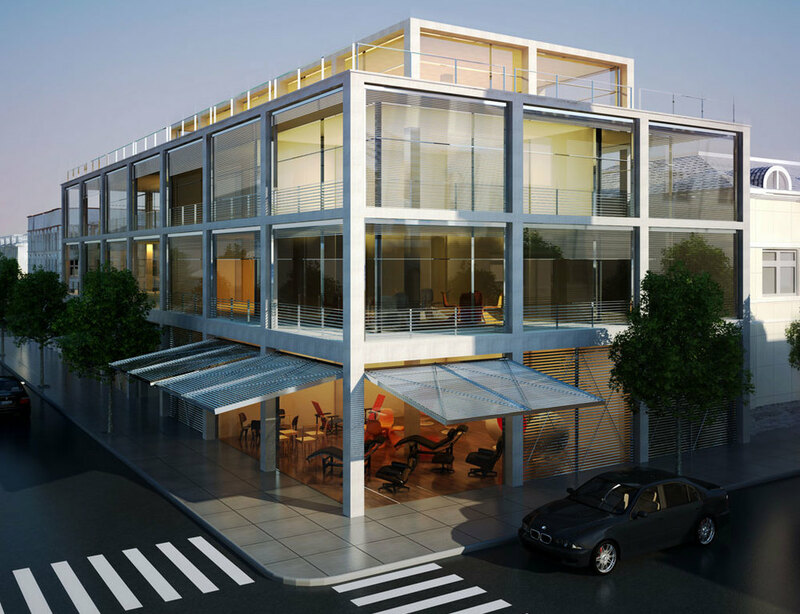 Major Materials: Steel and concrete structure, and glass. Why shouldn’t a museum building be as inspired and exciting as the art it holds? Why are we perpetually conceiving them as collections of white boxes locked within a grid structure? Axis Mundi breaks free of this form with its self-initiated proposal for the Whitney Downtown, experimenting—like all good art—with a more creative and challenging design. A dramatically irregular superstructure constitutes a perimeter lattice that conceals staircases, escalators, elevators and mechanical rooms. Column-free glass galleries are suspended like bridges from this lattice. In this way, the building more closely mirrors the actual creative process. For the faithful, the centuries-old foundation of the world’s great religions is a powerful symbol. Staying vibrant, however, means also viewing that ancient tradition through a contemporary prism. That was the aim of Axis Mundi’s proposal for a new cathedral in Strasbourg, France. The foundation, submerged below ground, represents the Latin cross plan of historic cathedrals: a long nave intercepted by a transept. The façade also evokes Gothic cathedrals with a digitized bas relief depicting abstracted arches, towers and tracery that become more visible as the sun casts shadows on its limestone surface. For the faithful, the centuries-old foundation of the world’s great religions is a powerful symbol. Staying vibrant, however, means also viewing that ancient tradition through a contemporary prism. That was the aim of Axis Mundi’s proposal for a new cathedral in Strasbourg, France. The foundation, submerged below ground, represents the Latin cross plan of historic cathedrals: a long nave intercepted by a transept. The façade also evokes Gothic cathedrals with a digitized bas relief depicting abstracted arches, towers and tracery that become more visible as the sun casts shadows on its limestone surface. Behind that façade, however, the familiar arches and groin vaults are replaced with a progression of slanted accordion folds conceived on the soaring scale of Europe’s famously inspiring basilicas. Glass walls between the folds invite in floods of glorious light, which come to rest on a dramatically minimalist altar and pulpit inspired by the basalt columns of Giants Causeway in Northern Ireland. Rising from it is a pure, unadorned bronze interpretation of Christianity’s most enduring emblem: the cross. Total Area: 25,000 sq. ft. Materials: Structurally reinforced concrete, limestone, seamed structural glass, bronze, and oak. “I imagined a labyrinth of labyrinths, a maze of mazes, a twisting, turning, ever-widening labyrinth that contained both past and future and somehow implied the stars. Mining is physically demanding task; it involves circulation and movement, expansion and compression, and demands the use of all senses. Poetically alluding to a journey through the mine, our proposal utilizes materials and textures, spatial sequencing, and lighting techniques to guide the visitor through an impactful sensorial experience. Upon entering the main pavilion, the tapered ramp gradually narrows as the visitor descends through the first gallery and below grade into the cavernous lower exhibition space. Controlled light, along with immersive, educational exhibits and artifacts engage visitors as they wander among the tall columns of the gallery, imagining themselves the miner and the exhibited materials their precious discoveries. Labyrinthine walkways guide the visitor through the dimly lit vastness of the mirrored gallery, where the tall tower, signifying a head frame, provides a distant light, suggesting the visitor is deep below grade. Providing a stark contrast to the expansive, dimly lit exhibition space, the excavated exterior sculpture garden provides space for the community; the void in the earth honoring the many miner’s lost and the unforgotten portion of American history, which our design seeks to preserve and enrich. Total Area: 16,000 sq. ft.
Where can a line lead you? The Surrealists believed automatically drawing one continuous line could take you into your subconscious. Many artists also use one unbroken line to create two-dimensional portraits or to limn recognizable forms. For Axis Mundi, one uninterrupted line leads to home. 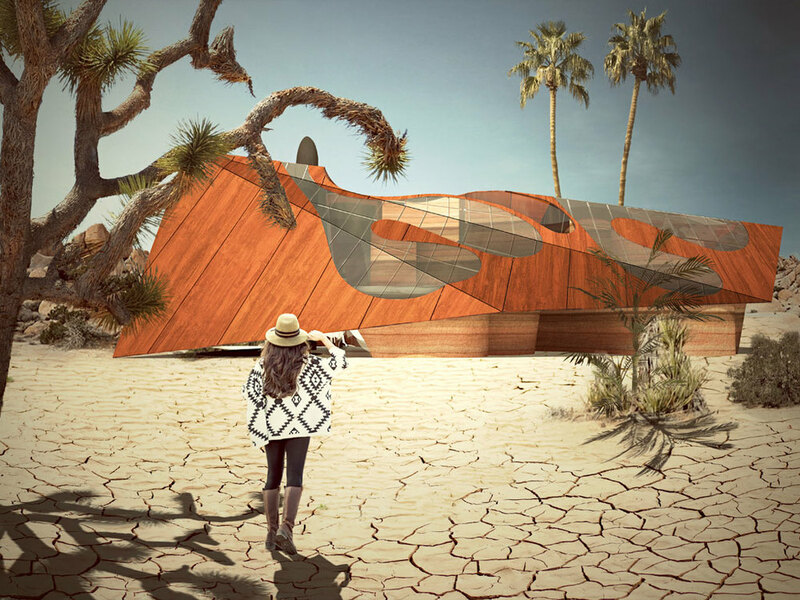 Or, more intriguingly, to the rhythmic underlying structure of this concept house for a successful digital entrepreneur in the Palm Springs desert. 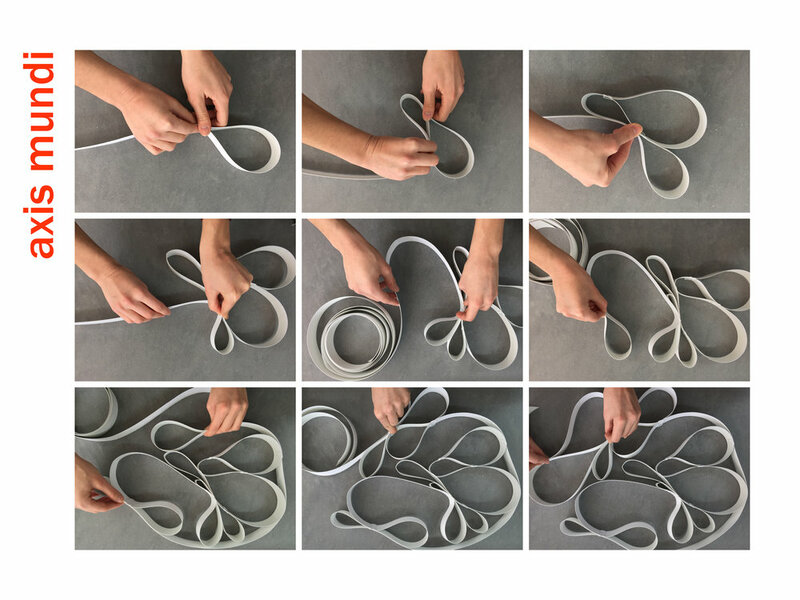 An homage to Austrian architect Frederick Kiesler’s 1950 “Endless House,” the basic footprint and floor plan derives from a single ribbon looped repeatedly in a single continuous line. 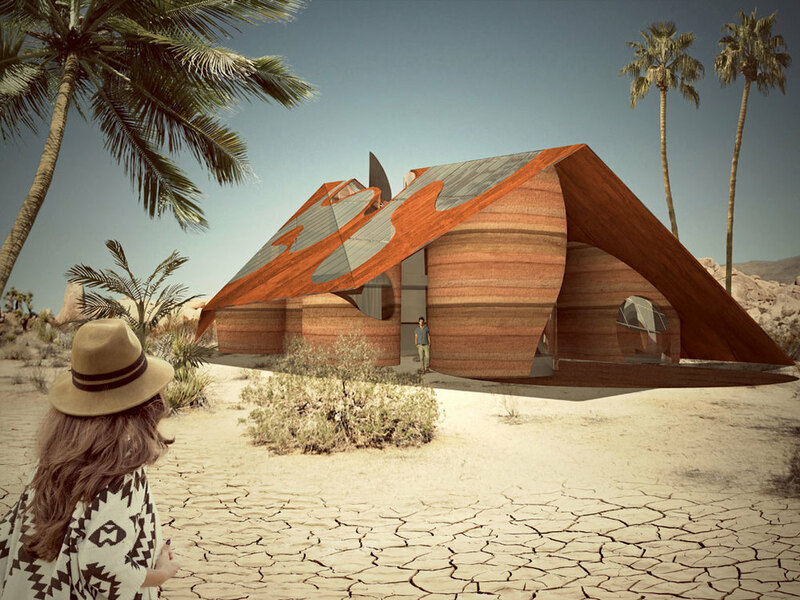 The home is enclosed with rammed-earth exterior walls built up along the undulating contours formed by the ribbon, while interior walls are erected around selected voids defined by some of the loops. A faceted tent-like Cor-Ten steel roof—out of which the shape of the floor plan is cut out and replaced with glass—tops the structure. It is both a line of intellectual questioning posed by the designers and a line of continuity that brings fluidity to a living plan for the client in question. In a city as diverse as New York—where over 300 languages are spoken amongst countless cultures and nationalities—it’s puzzling to find skyscrapers formatted in cookie-cutter, one-style-fits-all fashion. 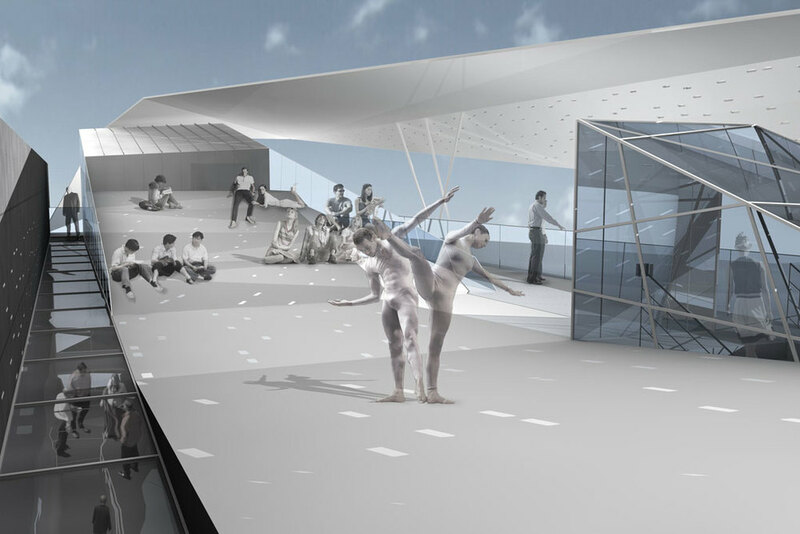 This proposal presents a radically different conceptual alternative. Taking inspiration from randomly piled Brazilian favelas and Italian hill towns, the design offers a more accommodating flexibility for individual expression. In a city as diverse as New York—where over 300 languages are spoken amongst countless cultures and nationalities—it’s puzzling to find skyscrapers formatted in cookie-cutter, one-style-fits-all fashion. This proposal presents a radically different conceptual alternative. Taking inspiration from randomly piled Brazilian favelas and Italian hill towns, the design offers a more accommodating flexibility for individual expression. Unit modules of 800 to 2,000 square feet, called “SmartBlocks,” are assembled like pieces in a three-dimensional vertical puzzle around two cores that run the full height of double towers. Each SmartBlock has a different exterior treatment based on a handful of iconic architectural styles, giving the irregularly stacked façade the appearance of a crazy-quilt vertical neighborhood. This alternative reframes the conversation around building tall while reflecting the heterogeneous reality of a great city. It represents a dynamic urbanism of difference, more visually alive than the glass-and-steel monotony of most city towers. Building Footprint: 17,000 sq. ft.
MoMA Expansion Galleries: 32,500 sq. ft.
Like a Phoenix rising from the ashes, the ancient Greek temple The Parthenon is being transformed into the world’s most expensive ultra-luxury residences. The planet’s most prestigious address is now on offer to the very highest echelons of the global super-elite, who have a once in a lifetime opportunity to enjoy a new rarefied standard of indulgence that puts the world’s 6 and 7 star hotels to shame. Residents will luxuriate in breath-taking panoramic views over the Mediterranean, whilst the lavish facilities include multiple helipads, 24-hour private butler service, luxury car chauffeuring, and temperature-regulated storage for wine, furs, cigars and perfume. The air-conditioning in each apartment includes an oxygen enrichment system that allows residents to breathe in the luxury. Opulent, hand-crafted interiors feature the materials of ancient Greece – marble and gold – as well as including fragments of classical art. The rock of the Acropolis has been excavated to create a magnificent underground health spa and gym. Seated majestically in this iconic location, the Residences Athénée provides the sumptuous stage set for a lifestyle that is unprecedented in human history. Axis Mundi’s proposal for this residence envisages a mammoth crystalline boulder protruding from the dramatic escarpment of the Palisades like a rock crystal emerging out of an implacable basalt matrix. Shooting vertiginously upward from the Hudson River and extending from Newark, New Jersey in the south to Nyack, New York in the north, this remarkable geological feature commands unparalleled views of Manhattan, the George Washington Bridge and the rolling hills abutting the river to the north. Axis Mundi’s proposal for this residence envisages a mammoth crystalline boulder protruding from the dramatic escarpment of the Palisades like a rock crystal emerging out of an implacable basalt matrix. Shooting vertiginously upward from the Hudson River and extending from Newark, New Jersey in the south to Nyack, New York in the north, this remarkable geological feature commands unparalleled views of Manhattan, the George Washington Bridge and the rolling hills abutting the river to the north. Beginning with a rectangular vertical shape drawn from the many viewing towers dotting the riverfront, the form is then pushed and pulled out in parts, resulting in what appears to be a bulbous, faceted outgrowth from the cliffs. These moves are dependent on desired framing of certain views, the sun’s path across the sky and topological considerations. The final form is a glass-sheathed polyhedron with main living spaces—kitchen, dining and living room—on the entry floor and bedrooms accessed by a floating stairway on the upper floors. Total Area: 3,500 sq. ft. Materials: Concrete structure, anodized aluminum panels, seamed glass with solar reducing pattern, photovoltaic standing seam roof. Axis Mundi eloquently captures the qualities of water—pristine, fluid, restlessly in motion—in its proposal for the Barcelona offices of H2O, a new bottled water company seeking to establish an innovative brand identity. The standard concrete structure of the existing building, just a stone’s throw from Gaudì’s masterpiece Casa Mila, is pierced with two elliptical voids that invite natural light into its core. Axis Mundi eloquently captures the qualities of water—pristine, fluid, restlessly in motion—in its proposal for the Barcelona offices of H2O, a new bottled water company seeking to establish an innovative brand identity. The standard concrete structure of the existing building, just a stone’s throw from Gaudì’s masterpiece Casa Mila, is pierced with two elliptical voids that invite natural light into its core. An inventive brise-soleil, however, belies the building’s stationary mass and volume by mimicking the ripples of a pond. The team documented countless images of light on the flowing waters of rivers, streams and ponds, one of which was eventually made into 3D form using a phenolic composite material. This was cut and manipulated to create wave patterns that appear to ripple and rush impossibly around the building. This skin is suspended in front of the façade by organically shaped web trusses. “All water has perfect memory,” wrote author Toni Morrison, “and is forever trying to get back to where it was.” This exquisite building reminds us of the source from which we derive life. For this residential proposal in Montana’s Madison Valley, Axis Mundi used a tried and true technique—taking design cues from rural buildings common to the landscape—but tweaked it by creating, in effect, a “barn with a view.” And a spectacular view it is. Bisecting the basic peaked form with a nearly 4,800-square-foot observation deck allows breathtaking outdoor viewing of Big Sky Mountain and Beaver Head National Forest. For this residential proposal in Montana’s Madison Valley, Axis Mundi used a tried and true technique—taking design cues from rural buildings common to the landscape—but tweaked it by creating, in effect, a “barn with a view.” And a spectacular view it is. Bisecting the basic peaked form with a nearly 4,800-square-foot observation deck allows breathtaking outdoor viewing of Big Sky Mountain and Beaver Head National Forest. The half that emerges from the bluff, which could also recall a covered bridge, serves as an entry pavilion. One can either step up to the observation deck from here or enter a 60-foot Cor-ten steel-and-glass bridge tucked under the stairs that overlooks a 3-story interior atrium and leads to the main living spaces in the other half of the structure. Underneath these are two floors of more private quarters. All rooms, however, have views: either out over the windswept valley or into the atrium. Geothermal heating and cooling, photovoltaic panels and high-performance building materials also ensure near-zero sustainability. Total Area: 10,200 sq. ft. including 4,800 sq. ft. observation deck. Materials: Reclaimed oak siding and beams, Corten steel, glass, photovoltaic standing seam roof, CMU, steel sub-structure. European gardens of the 18th and 19th centuries boasted architectural follies that mimicked Greek temple ruins, Chinese pagodas, Egyptian pyramids and other buildings. They were intended to make connections to the virtues of classical antiquity, travels to exotic lands and other evidence of one’s sophistication and breeding. This house adopts the idea intriguingly by excising pretense and frivolity to devise a unique solution to the steeply sloping topography of this site in Smuggler’s Nest, Vermont. For almost 50 years, 339 Lafayette was known as the Peace Pentagon because of the various activist groups headquartered there, including the War Resisters League, the Granny Peace Brigade and Global Revolution TV. Axis Mundi—one of 339 firms invited to reimagine the space after its sale in 2016—concentrated on another community-building vehicle: the arts. Stacking various public performance spaces, we wrapped the structure in tinted, triangulated, prismatic glass. For almost 50 years, 339 Lafayette was known as the Peace Pentagon because of the various activist groups headquartered there, including the War Resisters League, the Granny Peace Brigade and Global Revolution TV. Axis Mundi—one of 339 firms invited to reimagine the space after its sale in 2016—concentrated on another community-building vehicle: the arts. Stacking various public performance spaces, we wrapped the structure in tinted, triangulated, prismatic glass. This injects a dramatic new geometry into the streetscape. But because it reflects faceted views of its surroundings, the façade also represents a kind of diversity of perception (the lifeblood of activism). Perforated metal panels alternating with the glass modulate the light entering the building, much as a bris soleil does, energizing the interior spaces and making them more visually and socially dynamic. Finally, all the floors share a generously proportioned sky-lit stairway that invites in natural light and enhances ventilation, while also offering easy access to each space. The Cape Cod Museum of Art in Dennis, Massachusetts was established to preserve the artistic heritage of the area. Axis Mundi’s proposal for its design honors that heritage with a structure derived from the archetypal barn and shed forms ubiquitous throughout this picturesque peninsula. Yet rather than rely on straightforward imitation of these buildings, the design lays out several interconnected structures over a branching pattern, rooting them more firmly, if imperceptibly, to place by evoking the fractal geometries repeated throughout the natural landscape surrounding the site—trees, patterns of receding tides in the sand, plant roots and others. The Cape Cod Museum of Art in Dennis, Massachusetts was established to preserve the artistic heritage of the area. Axis Mundi’s proposal for its design honors that heritage with a structure derived from the archetypal barn and shed forms ubiquitous throughout this picturesque peninsula. Yet rather than rely on straightforward imitation of these buildings, the design lays out several interconnected structures over a branching pattern, rooting them more firmly, if imperceptibly, to place by evoking the fractal geometries repeated throughout the natural landscape surrounding the site—trees, patterns of receding tides in the sand, plant roots and others. Forming the spine of the museum, the galleries are lined with industrial skylights and structural steel half-trusses, allowing northern light to flood the exhibition spaces. The scale shifts to more intimate spaces in administration offices, restoration facilities and storage, a museum shop and café, and multipurpose/educational facilities. Non-profit institutional cost concerns are managed through economical industrial steel-shed construction, poured concrete, glass and untreated cedar siding. Modernism’s most sacred tenets—simplicity, utility, order, rationalism, form following function—were nothing new to the Shakers who settled New York’s Columbia County. This house, located in Chatham and not far from Hancock Shaker Village, therefore picks up on these parallel precedents to embrace both Shaker ideals and their natural outgrowth in the architecture of today. Modernism’s most sacred tenets—simplicity, utility, order, rationalism, form following function—were nothing new to the Shakers who settled New York’s Columbia County. This house, located in Chatham and not far from Hancock Shaker Village, therefore picks up on these parallel precedents to embrace both Shaker ideals and their natural outgrowth in the architecture of today. Here, a 16-foot entrance gallery lined with clerestory windows serves to separate principle living areas from bedrooms, while also functioning as exhibition space for a perpetually evolving collection of contemporary art and design objects. The house, raised on a concrete plinth, is clad in wood, while a separate studio showcases exterior surfaces covered in Cor-ten steel shingles. Yet the forms are unified by a continuous copper roofline. The interrelationship creates juxtapositions between urban and rural aesthetics, a sense of lofty volume grounded by humble materials and finishes, and an interplay between intimate rooms and the rolling wide-open landscape outside. Question: What is more luxurious than a view of the sea? Answer: A private view of the sea. This pool pavilion on the western coast of Quepos in Costa Rica achieves that level of luxury without imposing walls or gates. Instead, it builds toward it slowly and stealthily. Access to the view is not grand, just purposefully nondescript, offering a supremely unassuming gap in a wood-framed screen as an ambiguous point of entry. Question: What is more luxurious than a view of the sea? Answer: A private view of the sea. This pool pavilion on the western coast of Quepos in Costa Rica achieves that level of luxury without imposing walls or gates. Instead, it builds toward it slowly and stealthily. Access to the view is not grand, just purposefully nondescript, offering a supremely unassuming gap in a wood-framed screen as an ambiguous point of entry. Once in, however, we discover it conceals a lush secret garden to the left. On the right, a translucent glass wall further delays the main event. As we come around it and enter into a living-dining room with a small kitchen and bath, we see a pool bordered on two sides by the concrete exterior walls of the pavilion, its watery ripples disappearing over an infinity edge that directs the eye, finally, to one’s own personal perspective on the seascape beyond. “The only constant is change,” goes the old saying. Based on that premise, adaptability, especially in our rapidly shifting times, is a cardinal virtue. West Palm Beach Lofts is adaptable in a number of ways, not least of which is its mixed-use program (the ground floor is devoted to commercial spaces; upper floors to a variety of studios, multi-bedroom units and duplexes). "The only constant is change,” goes the old saying. Based on that premise, adaptability, especially in our rapidly shifting times, is a cardinal virtue. West Palm Beach Lofts is adaptable in a number of ways, not least of which is its mixed-use program (the ground floor is devoted to commercial spaces; upper floors to a variety of studios, multi-bedroom units and duplexes). Various elements, however, enhance that adaptability. Motorized perforated metal shutters at the outer edges of the building’s loggia enable a constant visual flux—ranging from entirely open, permeable box to a closed, secure minimalist cube—while also offering tenants instant privacy when desired. (These also, incidentally, provide hurricane protection.) Pivoting 10-foot-high glass panels open the interiors completely to the outdoors, while interior sliding glass doors also allow for variable states of revealing openness and partitioned seclusion. The building presents as modern, though its loggia also reference the deep verandas of Southern homes, thus simultaneously inhabiting the present and the past.